Hello people. Its been awhile hasn’t it? I am so sorry that I have not been able to update you guys on how everything happened on the day I passed out. Life has been so hazy lately and I’ve not been myself, even though I try so hard to make it look like everything is fine. I lost a grandmother, I lost a job opportunity and I even fell a little sick. But hey, life happens! And we keep living. So here goes. Even though my friends and I left early that day, we didn’t get there on time (because our car had a little problem on the road) but it was all good because we got there at the perfect time. The whole square was filled with many human beings: boys and girls all in White and green. Those that were doing the parade were on the parade ground in straight lines, at attention. My friends and I searched for and found a place to sit. We were seeing many people we knew from here and there. It was so emotional. I look back now and I realize that somehow I was already missing the whole thing, I mean, I was going to be separated from these people. The feeling of oneness would no longer be there. We would no longer be this bunch of people that were bound by our search for the same thing: an NYSC certificate. We were going to the outside world where we would be competitors fighting against each other, everyone looking for a way to be higher than the other. It was going to be tough, it was going to be survival of the fittest. My eyes were teary. But I couldn’t be negative, it was a positive day. So we kept smiling and taking pretty pictures. 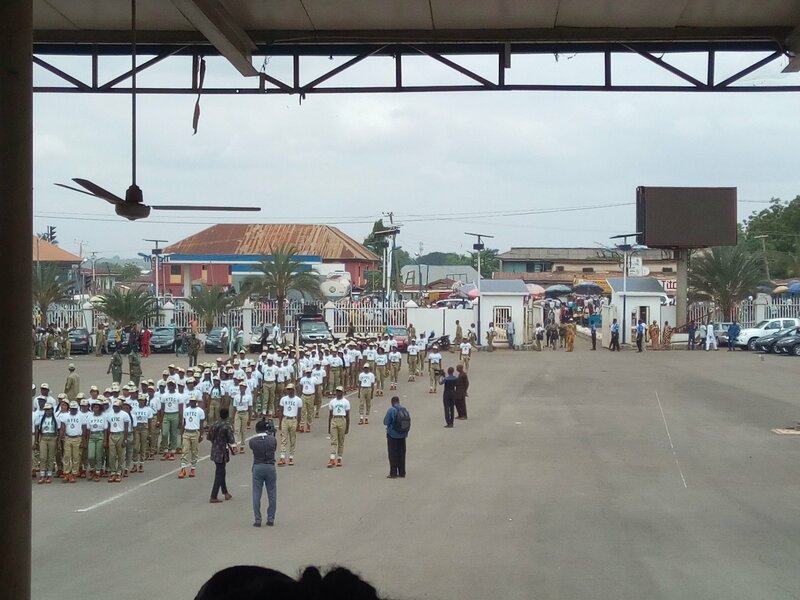 After the parade that ended with a massive applause from us, there were a couple of speeches made by the NYSC officials and invited guests. I have no idea what was said because the whole place was so loud. Trust corpers to make noise when they are together. The next thing was the sharing of our magazines. While other local governments made straight lines to collect theirs, our local government was a circus! Fadalurd, my breasts suffered so much because like everyone, I was struggling to get through the crowd. We had to show them our clearance and ID cards to get the magazines so it was difficult for those that were already in front to collect for others. After much struggle, I am happy to tell you that I collected the magazine. Hallelujah! 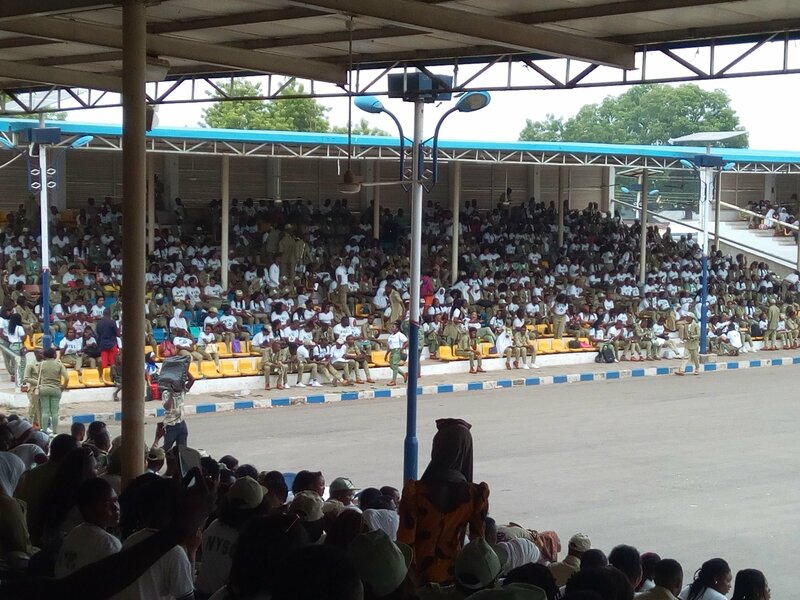 It did not contain much though, just mostly pictures of all Corps members that were passing out. Next was the collection of the certificate proper. There were officials at different tables marked with a range of numbers. All you had to do was to find the table whose range of numbers included yours, stay on the queue and wait your turn. My number was in the last table that ranged from 2000+ to 5000+. Even though we were not many on my queue, the line was slow because, trust Nigerians to always be Nigerians. I saw this beautiful set of twins while I waited for my turn and asked to snap them because I adore twins and hope to have them one day. I’m going to have twins one day! “1234?” Asking to confirm my state code number. “Is this not 1234?” she asked pointing at the number on my ID card. “Yes,” I answered, a bit confused. Then I realized that I have been filling forms and doing clearance with the wrong state code. I had mixed up the two middle numbers. The man searched for and found my certificate but held it. I remembered every lesson note I prepared. Every paper I wrote in Anambra. Every clearance I did. After everything, my village people were trying me? I am invisible. So I smiled. He allowed me to sign on the forms that had all our names on it that proves you have collected yours and handed me my certificate. I wish I was as excited as these people. So I’ll never wear this again? There, guys. I am now a non-serving, unemployed, living-with-her-parents graduate. So please, if you hear of any vacancies, preferably in Abuja, please let me know. Allow the Lord to use you, biko. So happy for you and sorry about your grandparent. But I’m just going to say thank you so much for this encouragement. You’ve made my day! Congrats on passing out! Wishing you the utmost best for the next level of your life and job search – I’ll definitely let you know if I hear of any opportunities! You should list your qualifications so that we’d know where you’d fit into! Good luck, can’t wait for more posts on the transition and all! Are you eventually going to change your blog name? In the meantime, you can write on tips for NYSC, important things to note, how to survive from camp to passing out, etc! Can’t wait to see what you have in store for us! Oluchi of IdleHead and I spoke about changing my blog name once. It all boils down to writing posts like you just suggested if I don’t change the name. I’m going self hosted real soon. I think that will help me put things in perspective better. Sorry for your loss dear. I know how it feels when you eagerly await something and when it comes the meh feeling just takes over. Now we have gotten a picture of your leg, maybe you want to reveal one body part at the time. I suggest face as the next. Lol… I have to pass it to the board of directors to see if they approve first 😁😁. Lol.. You’re such a funny writer.. Loved the articles and congrats dear on rounding up NYSC.. I love your writing style girrrrrrlll 😂😂😂 Congrats on your pop (even if it’s coming late). Im passing out in some months and I can’t wait honestly! Kwara state don tire me. I think it’s time you changed your ‘about me’ page 😉 About the job stuff, why don’t you create an account on linked it listing your qualifications and all that. That’s like an online resume to help employers find you! I’ve done the LinkedIn thing already …. I just hope it pays off soon.